After the success of Jyo Achyutananda, Naga Shaurya is gearing up to start filming his upcoming film. It is said to be a romantic entertainer set in a college backdrop and Kannada actress Rashmika Mandanna, who shot to fame with Kirik Party, will be making her Tollywood debut with this film. 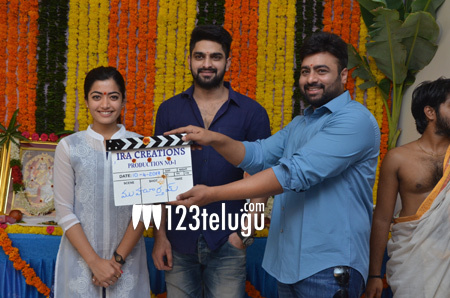 Nara Rohit sounded the clapboard for the film at the opening ceremony earlier today and the film is going to directed by Venky Kudumula, a former associate of Trivikram Srinivas. The shooting will begin later this month. Sai Sriram is the cinematographer and Sagar Mahati is the music director. Shankar Prasad and Usha are going to produce the film under Ira Creations banner.